FORT WORTH, Texas (Sept. 9, 2014) – After directing the third-ranked Oregon Ducks past No. 7 Michigan State and its vaunted defense, senior Marcus Mariota has been named the season’s first Davey O’Brien Quarterback of the Week. 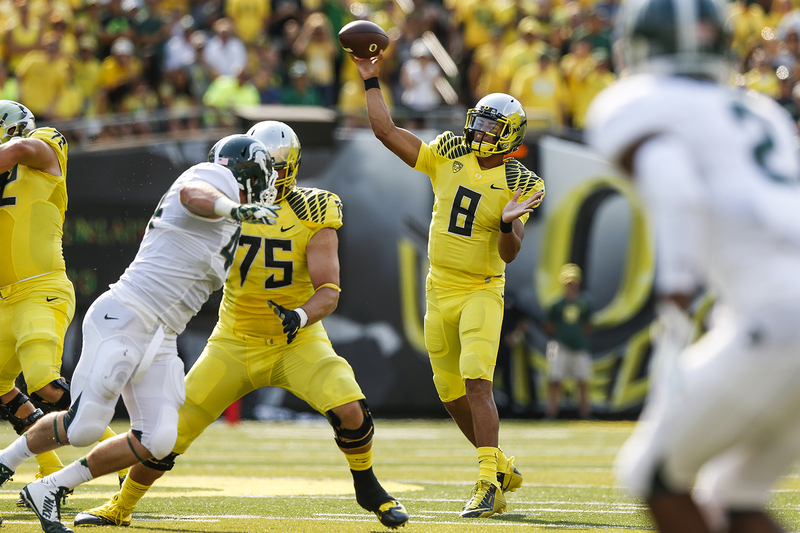 Against one of the top defensive units in the nation, Mariota passed for 318 yards (17-of-28) and three touchdowns. He also added 42 yards rushing as the Ducks amassed 491 yards of total offense en route to a 46-27 victory. In addition, Mariota did not commit a turnover and became Oregon’s all-time leader in passing touchdowns and total yardage during the contest. He has thrown touchdown passes in all 28 games of his college career, and his three touchdown passes Saturday all went for more than 20 yards (24, 37 and 70). Mariota, a semifinalist for the Davey O’Brien Award in 2012 and 2013, is 31-for-48 (64.6 percent) for 585 yards and six touchdowns through two games. He ranks fourth nationally in passer efficiency (208.21 rating) and is tied for second with an average of 12.2 yards per pass attempt. It is the second time that Mariota has received the weekly honor. He was previously named on Oct. 14, 2013. All 128 FBS quarterbacks are eligible for the weekly honor, which is determined by a subset of the Davey O’Brien National Selection Committee. The final weekly award will be issued on Oct. 27 prior to the paring down to 16 semifinalists for the Davey O’Brien National Quarterback Award on Nov. 3.